Visit the Chelsea Flower Show, Hidcote, Great Dixter, Sissinghurst, Gravetye Manor + private gardens & more. All breakfasts and 4 dinners. Admission to all gardens including tips. Ground transportation between hotel and airport on departure day. Friendly and knowledgeable professional tour coordinator. Design and botanical expertise of your CarexTours leader. 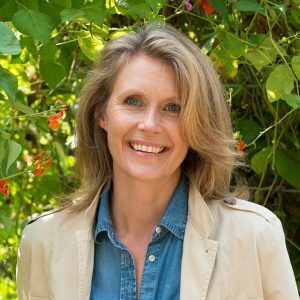 Marianne Willburn is an American freelance garden journalist, weekly columnist, author and Master Gardener with over two decades of experience gardening in places as diverse as Southern California, The United Kingdom, and the Mid-Atlantic. She is the author of Big Dreams, Small Garden, and has won several national awards for her popular column and blog, The Small Town Gardener. Marianne is a California native, but she and her family have made their home in rural Loudoun County, just outside Washington DC. An avid traveler and tourer of gardens both domestic and international, she feels strongly that exploring great gardens increases the energy and thoughtful design choices in our own. She’s thrilled to be joining Carolyn in bringing many of these gardens to you! The access to private gardens and their owner/designers was excellent. A simple love of plants and a belief that gardeners make the world a better place is the organizing principle behind the Royal Horticultural Society’s world-famous Chelsea Flower Show. On this tour, garden lovers will get a chance to explore this international event where the very best contemporary garden design talent and the newest horticultural knowledge is on full display. We couldn’t plan a tour to England without also seeing the best country gardens. 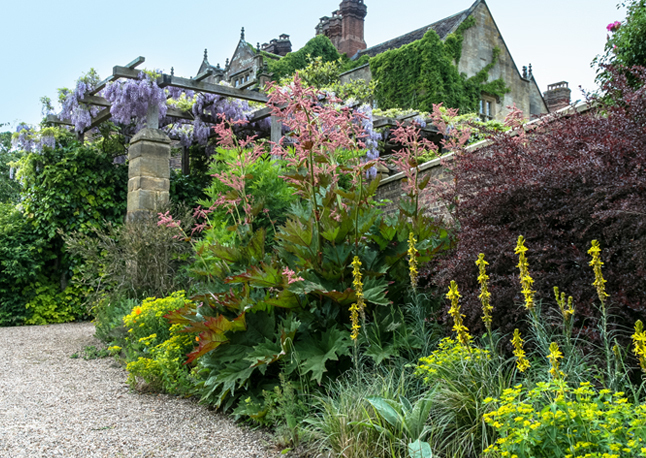 We’ll explore the beauty of classic, early 20th century gardens like Hidcote, Sissinghurst, and Kiftsgate and be dazzled by lush private gardens such as Fairlight End, Broughton Grange, and Pettifers. Our delightful dip into historical and contemporary gardens will take us to all these worthy garden destinations and more. CarexTours strives to operate according to our published itinerary. However, in the event unforeseen circumstances beyond our control or opportunities that would enhance the itinerary, adjustments may be necessary. Tour members independently arrange travel to Heathrow Airport and transfer on their own to the Hilton London Heathrow Airport, Terminal 4 where a room has been booked for them (included in the tour price). We’ll gather in the hotel bar to get acquainted at 6:30 PM for Welcome Cocktails. The first drink is courtesy of carexTours. Dinner will be in the hotel at a venue of your choice (not included). We begin our tour south of London at Great Dixter, perhaps the best known and most loved of all English gardens. It exists as a living testament to the life and passions of the late owner, plantsman, and writer, Christopher Lloyd. Head gardener Fergus Garrett, who worked for Lloyd during the last years of his life, carries on the tradition of experimentation that Lloyd started. Although the structure of this garden is early 20th century, the spirit of the plantings is most undoubtedly contemporary. Under Garrett’s leadership, the garden is being developed and maintained to such a high level that you are unlikely to find any other garden like it. Great Dixter is a visionary, exuberant, plant lover’s haven. Expect to see contemporary planting design at its best. After a pub lunch, we’ll drive a bit closer to the English Channel to visit Fairlight End, a young private garden set on land that slopes steeply from the house downward across wildflower meadows to a pond at the bottom. New owners, baffled by the unwieldy topography, brought in landscape architect Ian Kitson whose signature gesture is the curve. Here, he inserted a single curvaceous corten steel retaining edge to separate the more refined garden close to the house from the wilder areas below. Fairlight End is not the only example of the contemporary English taste for wild gardens we’ll see on our tour, but it is undoubtedly the most stylish. We’ll check into the Marriott Tudor Park hotel in Maidstone, Kent for the night and have dinner together at the hotel (included). We begin our day at Sissinghurst Castle Gardens. These gardens are treasures today thanks to the commitment, imagination, and marriage of writer Vita Sackville-West and diplomat Harold Nicolson. In the 1930s, he planned the gardens’ architecture, and she filled it with lush, romantic plantings. Besides exploring the series of famous garden rooms, make sure you climb the tower and take in the panoramic views from the top. From this vantage point, it’s easy to see why thousands of garden lovers consider a pilgrimage to Sissinghurst an absolute must. Our next garden is Gravetye Manor in Sussex. It’s a country house hotel where we’ll have a special lunch in its Michelin Star restaurant and then stroll the gardens with their lovely views of the surrounding countryside. Created a century ago by Irish writer, designer, and owner, William Robinson, he used the garden to showcase his ideas about naturalism and wild gardening, contrasting untamed plantings with more structured areas close to the house. Today, the gardens have had an extensive restoration but don’t expect to see a historical set piece. Tom Coward, after a stint at Great Dixter, is the current head gardener and adding experimental plantings, giving the garden a 21st- century twist. We’ll return to Marriott Tudor Park for the night and have dinner together at the hotel (included). We begin our day at the Royal Horticultural Society Garden, Wisley. For more than 100 years, Wisley has been a center of British gardening excellence. Although the garden spreads over 240 acres, we’ll focus on the demonstration gardens which feature everything from stream gardens to meadows to classic double borders. Expect to see lots of colorful May flowers wherever we stroll: tree peonies, camassia, allium, roses, iris, wisteria and giant rhododendron, all beautifully grown. Not to be missed is the new Glasshouse with nearby perennial borders created by influential designers Tom Stuart-Smith and Piet Oudolf. Lunch will be at any of the Wisley restaurants or cafes. This afternoon we’ll travel northwest from Surrey through Oxfordshire to Chipping Campden in the Cotswold district of Gloucestershire. The well-preserved village is known for its beautiful High Street with many shops and cafes, ancient houses and church, and the Guild of Handicrafts. This stop at Chipping Campden will be an opportunity to take a stroll in a typical English village and perhaps pick up a few souvenirs to take home. We’ll journey on to Stratford-on-Avon in Warwickshire and check into MacDonald Alveston Manor hotel. Tonight you may have dinner at the hotel or a restaurant of your choice in town (not included). First today, we visit Pettifers, a stylish, townhouse garden designed by the owner Gina Price. With little gardening experience, Price started in the early 1990s with a conventional, old-fashioned garden. Gradually through visiting other gardens and asking for criticism from knowledgeable friends, Price began editing. Today Pettifers is known for its innovative plant choices, unusual plant pairings, and vivid color combinations, all within a confident structure. Price admits to being influenced by the New Perennials Movement but says she couldn’t have a garden without English prettiness. Pettifers is a garden that’s sure to please. We’ll have lunch in a pub before going on to Broughton Grange to explore a captivating design by Tom Stuart-Smith. Part of a larger 19th-century garden, the owners decided to make a significant addition in 2000 by transforming a paddock into an ambitious 6-acre walled garden. Three themed terraces traverse a slope and open to the surrounding rural landscape. We’ll see masses of perennials and grasses punctuated with topiary, a modern boxwood parterre based on leaves, beech tunnels, pleached lime squares, and a rill carrying water into a large stone tank. The scale of Stuart-Smith’s 21st-century design is a bold step away from typical English garden rooms. Elsewhere at Broughton Grange is a knot garden, huge arboretum, spring walk, woodland, stumpery, bamboo grove, and rose garden. We’ll return for the night to MacDonald Alveston Manor and have dinner together at the hotel (included). This morning we’ll be at Hidcote Manor Garden. Starting in 1907, Lawrence Johnston, a talented plantsman with a strong sense of design, created the garden considered by many to be a masterpiece. A series of hedged, intimate, outdoor rooms, each with its individual character, are linked by narrow passageways that eventually lead to lawns and views to the countryside beyond. Throughout, Johnston used a vast variety of plants, many found on his plant collecting trips. It’s noteworthy that Hidcote with its themed garden rooms changed how gardens were made in England and is still influencing garden makers today. We’ll have lunch at Kiftsgate Court before delving into its gardens. A visit to Kiftsgate is not complete without an understanding of how three generations of women in one family have shaped the garden and made it into a beloved treasure. The garden was started in the 1920s by Heather Muir who boldly employed an intuitive approach to creating gardens instead of using a more formalized plan. In the 1950s, Muir’s daughter, Diany Binny, continued the garden’s evolution by introducing a semicircular swimming pool on the lower level, commissioning sculptural features, and opening Kiftsgate for public enjoyment for the first time. Today, Anne Chambers, daughter of Binny and granddaughter of Muir, shapes the garden. Her new Water Garden is a contemporary oasis and evidence of her desire to bring the garden into the 21st century. We’ll again stay at the MacDonald Alveston Manor. You may choose to have dinner at the hotel this evening or at a restaurant of your choice in Stratford-on-Avon (not included). Rousham Garden was designed by William Kent (1685-1748), the landscape designer who popularized a natural landscape style for estates. 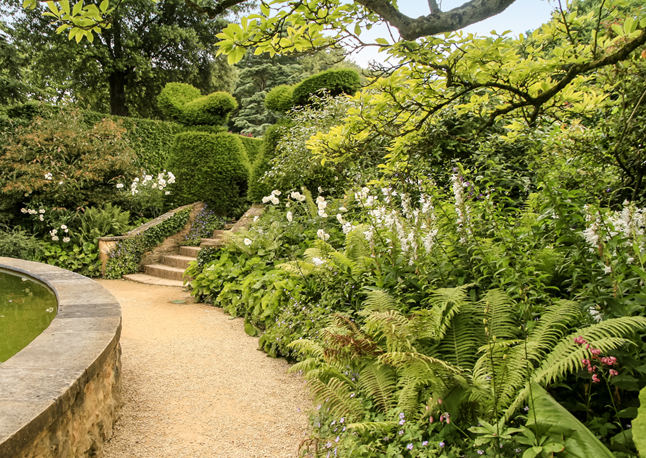 Rousham is the only 18th-century garden featured on our tour and is considered by many to be the single best example of a landscape garden in the country. Little has changed over the centuries at Rousham. The views and accents Kent designed are still there for us to enjoy today. 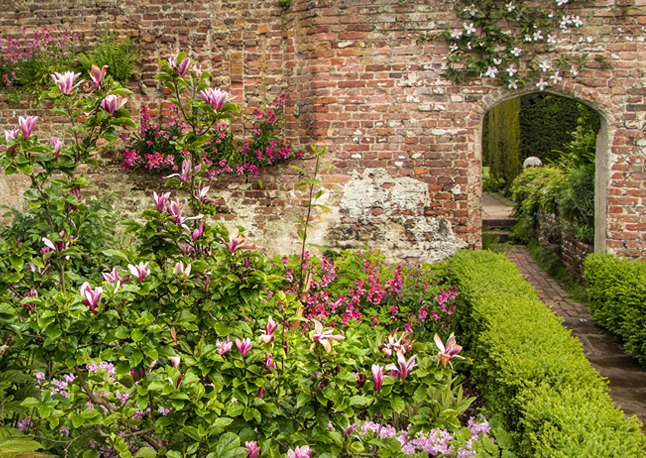 Make sure to leave time to check out the walled garden with its long double borders, pigeon house, and kitchen garden. We’ll stop at a pub for lunch on our way back to London. After checking into the Richmond Hill Hotel in Richmond-upon-Thames, Surrey, you’ll have the rest of the afternoon and evening free to explore close-by Kew Gardens, sightsee in Central London, or visit the spa on the grounds of the hotel. You may choose to have dinner at the hotel or a restaurant of your choice (not included). In the afternoon we’ll travel to the site of the Chelsea Flower Show. Each year this garden event attracts gardeners and designers from every corner of the globe. The show consistently celebrates design excellence with its competitions for Best in Show, Best Fresh Garden, and Best Artisan Garden. Not to be missed is the Great Pavilion where nurseries and plant societies exhibit the best and newest in international horticulture. We’ll be tired but inspired by the time we leave having just explored what many call the best garden show in the world. We’ll return to Richmond Hill Hotel and come together for one last time for a Farewell Dinner at the hotel (included). Our time together will come to an end, but garden lovers always find fresh inspiration wherever they are. Tour members can choose to return home or carry on the adventure. We’ll provide coach transfer to Heathrow Airport at 7:30 AM for those with flights leaving at 11:00 AM or later. Alternatively, you can take a taxi at a time of your choosing from the hotel to the airport. 8 lunches, 4 dinners, drinks, and snacks. Lunch & dinner on arrival and departure days. Tips for driver & tour coordinator. A $1,000.00 (USD) deposit is due when you book your tour. Final payment, in full, is due on March 15, 2019. NOTE: CarexTours offers thoughtfully arranged garden tours. Each tour is guaranteed to proceed as soon as the minimum of 10 reservations has been met. In the event that our reservation minimum is not met, CarexTours reserves the right to cancel the tour. Deposits/payments will be refunded in full if the tour is canceled. Please DO NOT make your airline reservations until CarexTours has guaranteed (by email) that the tour will proceed. After a day filled with garden inspiration and botanical discoveries, we will retire to the comfort and convenience of 4 star accommodations. Rooms are double occupancy with the option for a single room for an additional fee. Daily transportation will be provided by a modern, comfortable coach operated by an experienced driver. CarexTours, LLC is a limited liability company organized under the laws of the state of Maryland in the United States. CarexTours hosts garden tours operated by Garden Tours. As the hosting organization, CarexTours provides reservation services and has chosen Garden Tours, a professional tour operator, as its designated tour operator. As the designated tour operator, Garden Tours arranges for the actual tour of the garden sites. Garden Tours also acts as an agent for services connected with specific tours hosted by CarexTours such as ground transportation, lodging accommodations, and meals. Each service provider is solely responsible to the participant for providing their respective services. By making a reservation for a tour hosted by CarexTours, the participant certifies that she/he does not have any mental, physical, or another condition or disability that would create a hazard for him/herself or other participants. CarexTours and Garden Tours, reserve the right in their sole discretion to accept, decline to accept, or remove any participant on a tour hosted by CarexTours. The tour prices in this agreement are based upon current exchange rates, tariffs, and taxes. Fluctuations in these rates could result in a price adjustment without prior notice until the tour is paid in full. Once the price for the tour is paid in full, the fee will not be adjusted due to any later change in exchange rates, tariffs or taxes. Garden Tours is established in the Netherlands, and rights and responsibilities for all tours operated by Garden Tours will be governed by Dutch and EU laws only. CarexTours and Garden Tours will have responsibility only for the proven negligent acts and omissions of its employees or agents and suppliers, subcontractors, servants and/or agents of the same while acting within the scope of or in the course of their employment in respect of claims arising as a result of death, bodily injury, or illness caused to the signatory to the contract and/or any other named persons on the booking form. All participants in tours hosted by CarexTours agree to comply with a non-smoking policy on all coaches, in restaurants, and in all lodging places. CarexTours and Garden Tours have no responsibility or liability to any person for loss of baggage, money or other property whatsoever. CarexTours and Garden Tours have no responsibility or liability for any loss or additional expenses caused by delay or interruption to travel services through weather conditions (such as rain, wind or fog), civil disturbance, riot, illegal acts of third parties, strikes, wars, floods, sickness or any circumstances amounting to Force Majeure. In the unlikely event that you have a complaint, you must promptly notify the CarexTours host or the Garden Tours tour coordinator directly, so he/she can take remedial action on the spot. If the matter cannot be solved directly, any complaints must be submitted in writing to CarexTours within 20 days after the date of your return. CarexTours aims to provide your tour as booked. We reserve the right to cancel your tour in any circumstances, but if we cancel your tour, except where this is because you have not paid, you will receive a full refund. CarexTours and Garden Tours strive to operate according to the published itinerary. However, in the event of unforeseen circumstances beyond our control or opportunities that would enhance the itinerary, adjustments may be necessary or appropriate. CarexTours and Garden Tours reserve the right, without penalty, to make changes in the agreed-upon itinerary whenever, in their judgment, conditions warrant or if they deem it necessary for the comfort, convenience, or safety of participants. CarexTours will let you know about any important changes as soon as we can if there is time before your departure. Otherwise, we will announce changes on the tour. If you should need to withdraw from the tour for whatever reason, you must notify CarexTours in writing. Cancellation becomes effective when written notice is received. There will be no refunds from CarexTours on or after March 15, 2019. Travel insurance is required in case you need to cancel your trip after March 15, 2019, you have health emergencies while on the tour, or other unforeseen issues arise. Squaremouth and Insure My Trip are two travel insurance search sites. If you are under 70 years old, World Nomads is usually an economical travel insurance choice. You will be required to provide evidence to CarexTours that you have obtained travel insurance by March 15, 2019. To book this tour, contact Carolyn Mullet at camullet@gmail.com or 240 429 0889. Your reservation will be secured after a deposit/full payment is received. Additional information about CarexTours costs, including details about inclusions and exclusions, can be viewed on our pricing page. PLEASE NOTE: CarexTours reserves the right to cancel the tour. Deposits/payments will be refunded in full if the tour is canceled.